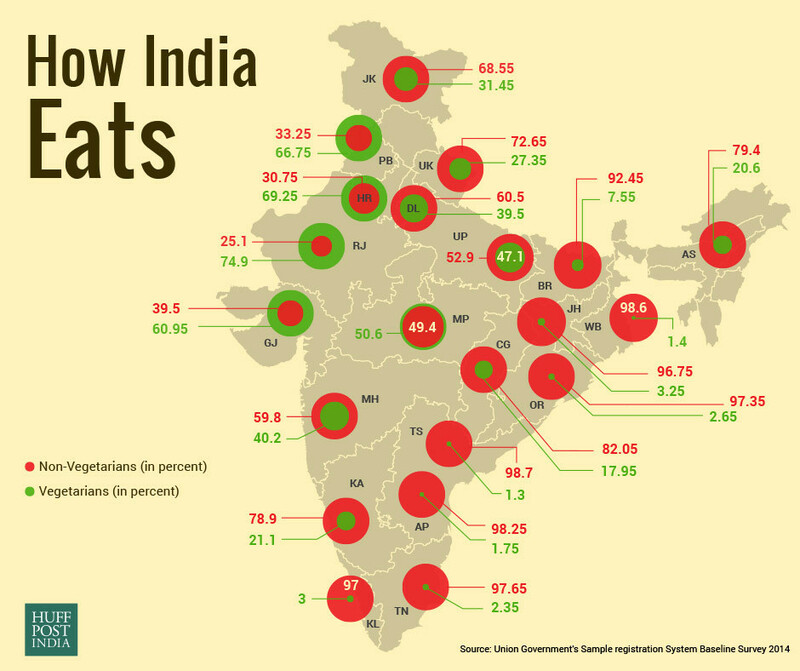 This chart shows How India Eats..
Vegetarianism is the practice of abstaining from the consumption of meat, and may also include abstention from by-products of animal slaughter.Vegetarianism may be adopted for various reasons. Many people object to eating meat out of respect for sentient life. Such ethical motivations have been codified under various religious beliefs, as well as animal rights advocacy. Other motivations for vegetarianism are health-related, political, environmental, cultural, aesthetic, economic, or personal preference. In most societies the great majority of people eat meat when they can get it, but increasing controversy and debate has arisen over the ethics of eating animals. The most commonly given ethical objection to meat-eating is that as, for most people living in the developed world, it is not necessary for their survival or health;slaughtering animals solely because people enjoy the taste of meat is argued by some to be wrong and morally unjustifiable. Ethical vegetarians may also object to the practices underlying the production of meat, or cite their concerns about animal welfare, animal rights, environmental ethics, and religious scruples. In response, some proponents of meat-eating have adduced various scientific, nutritional, cultural, and religious arguments in support of the practice. Some meat-eaters only object to rearing animals in certain ways, such as in factory farms, or killing them with cruelty; others avoid only certain meats, such as veal or foie gras. Indians no longer need a reason or a special occasion to eat out. Indians—across metro and non-metro cities—eat out simply because they want to experiment, love food, or that’s how they want to spend their free time. How India Eats, i.huffpost.com, viewed 14th February, 2017, <http://i.huffpost.com/gen/4420258/original.jpg>. How India Eats, ChartsBin.com, viewed 20th April, 2019, <http://chartsbin.com/view/43794>.